My wife Kathy and I were among the volunteers who assembled at the American Philatelic Center for Volunteer Week in Bellefonte, PA which took place July 25-29. Volunteers were able to select from a variety of helpful tasks identified by APS and APRL for their contribution of labor. The APRL, where Kathy and I volunteered, needed help with rearranging their book stack area, going through duplicate auction catalogs, and cataloging publications. Although we were only able to participate for three of the five days, we found it to be an enjoyable and rewarding experience. As one of the trustees of the APRL I found it to be a particularly valuable opportunity. On the receiving end volunteers were treated to an exceptional tour of the American Philatelic Center by APS Executive Director Ken Martin which included both current space and future space. We were able to meet many of the great staff members at both APS and APRL. 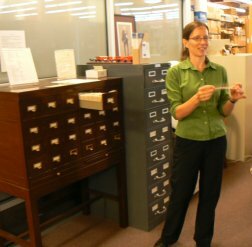 Tara Murray, APRL Director of Information and Librarian, gave library volunteers a tour of the special collections and research tools of the library. In addition to other volunteer tasks, I had the opportunity to sit in with library staff on some of the discussions of plans for expanded space for APRL at the American Philatelic Center complex. I highly recommend Volunteer Week at the American Philatelic Center as an opportunity to give and to receive in behalf of philately.